Induced meandering is a method I have been developing for over 20 years. I use it for restoring sinuosity to stream channels which have been artificially straightened, or which have straightened naturally as a result of human activities in the watershed. Such activities can include deforestation, agriculture, over grazing, roading and urbanization; activities that remove vegetation, expose soil to erosion and increase the rate and volume of runoff spilling from the land after a storm event of a given magnitude. As the volume of flow increases, velocity increases creating additional energy; energy that is dissipated by eroding first the bed of the channel making it deeper and straighter and then its banks, making it wider and less deep. Streams tend to meander. This applies to all streams whether ephemeral, intermittent, or perennial. The amplitude of the meander is a function of the steepness of the slope, the cohesiveness of the bed and bank material and the density of streambank vegetation. The course of the stream reflects the uneasy balance between an irresistible force and an immovable object. The force is the power of running water as energized by the force of gravity. The immovable object is the cohesiveness of the stream bank due to rock, sediment or vegetation. Any change in the power of the river or the resistance of the stream bank to erosion changes the meander pattern, because the balance is altered and the meander bends become longer or shorter as the result. This holds true for gullies, streams and rivers of any size, whether perennial or only part time. Induced meandering is a method for restoring the dimension, pattern and profile of an incised channel back to normal, following a period of incision, narrowing and straightening. On your next airplane ride, get a window seat, put down your magazine or computer, look out the window and observe the beautiful sinuous patterns of a healthy river as it winds across the landscape below. Notice how the river keeps to the same width, the bends tend to be evenly spaced and that the curves have about the same radius unless influenced by a different geologic or manmade feature. I first used induced meandering in Mexico in 1995. I then used it on Pueblo Colorado Wash, Hubbell Trading Post National Historic Site, Arizona, begining in 1997. A half mile reach was treated. The stream had been artificially straightened and it downcut as a result. Channel width was 12 – 16 feet, depth 8 – 12 feet and its sinuosity was only 1.06, “1.00” being perfectly straight. By measuring a relatively undisturbed reach of the same stream, I determined that the normal channel width was 28 feet, channel depth 1.8 feet and sinuosity 1.2. This means that for every 100 feet of valley length, the stream length was 120 feet. The healthy reach had an accessible flood plain. The straightened reach had no flood plain. The meander length, S to S, was 280 feet. I used baffles to deflect the river into its banks, and weirs to stabilize the bed of the channel and capture sediment. Baffles and weirs were built to predetermined dimensions and spacing intervals, replicating the natural bends and slope of the reference reach. After completing the structures, we waited anxiously for the first flood, then subsequent floods. As expected, each flood eroded the bank opposite the baffles, and the resulting sediment collected on the stream bed behind the weirs and on the inside bank at each baffle, creating a bend in the river. The river was beginning to meander once again! It was no longer cutting deeper into the valley floor. It was beginning to build a new floodplain as well, where the speed of the fast moving flood water slowed as the water spread out. Some structures failed or were damaged and had to be removed, modified or relocated to fit the evolving pattern. It was a steep learning curve! For the next 6 years, as the channel banks receded, we added to the tips of the baffles in order to maintain their effectiveness. At the same time, as the bed of the channel aggraded, or built up, we added to the height and width of the weirs in small increments in order to trap more sediment at riffles without creating small waterfalls that would scour the streambed. Seventeen years later, 2014, the gully has completely disappeared. The bed of the channel has come up from 8 – 10 feet. The river now meanders. Each meander is approximately 280 feet long, regular and sinuous. The channel has widened from the original 16 feet to 30 feet and the stream now has access to a floodplain 120 feet wide. Maybe most importantly, the water table has risen by 11 feet and the stream now holds perennial pools furnishing habitat for fish, frogs and aquatic insects. I have seen ducks and an occasional heron using these pools where none existed in 1997. Stream banks, once again, support healthy stands of willow, cottonwoods, sedges, rushes and aquatic vegetation, some of which we planted and some of which came in on its own. 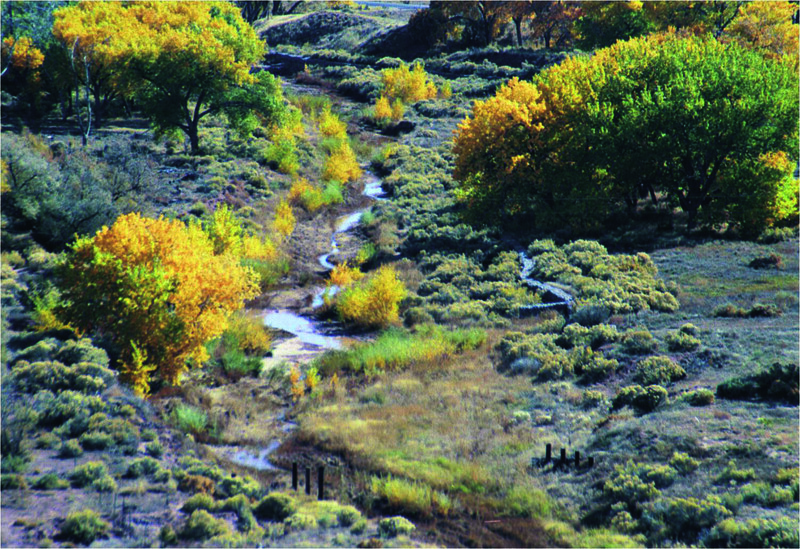 Planting vegetation in strategic places, such as point bars, speeds up development and stabilization of the meander pattern. All the structures have been buried and are no longer visible. They did their job. The meander pattern seems natural. I have since used induced meandering on many other channels and gullies. It has worked there too, restoring healthy streams and the riparian areas adjacent to them. 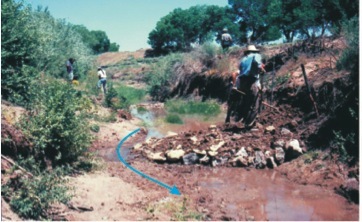 Prior to “induced meandering,” the customary treatment for gullied channels has been to install check dams of arbitrary dimensions and spacing. Typically, these were built of rock, concrete or rock-filled wire baskets with the goal of slowing the flow and capturing sediment in the pools. Usually the initial response was quite encouraging as velocity lessened, the water table rose and riparian vegetation responded. However, in my experience, over the long run, check dams almost invariably fail for one of two reasons; either the force of the falling water digs a deep scour pool and the dam crumbles and falls into it or; the stream erodes a channel around the dam and bypasses it. As Dave Rosgen puts it, “a river does not want to be a lake.” Whenever impounded by dams, especially with amateurish structures such as check dams, the river will set about their destruction. Induced meandering assists the river to flow like a river, not as a chain of artificial lakes that flow in fits and starts, fast-slow, fast-slow, while chafing to run free. Various types of structures, in addition to baffles and weirs, can be used to achieve induced meandering, some of which have very specific purposes. These include rock vanes, log vanes, post vanes, cross vanes, Zuni bowls, rock rundowns, boulder weirs, wicker weirs, one rock dams and others. Of course, structures need to be properly sized and installed. All can be built by hand or machine as appropriate to the size of the channel and magnitude of expected flood events. I will describe each of the basic structures and how to build them in future posts. In the meantime, please see my book, “Let the Water do the Work: Induced Meandering, an Evolving Method for Restoring Incised Channels” by Bill Zeedyk and Van Clothier. If you are interested in purchasing one, please contact me at billzeedyk@centurylink.net. I can also let you know of any planned workshops on induced meandering or related topics. Planning and constructing your own induced meandering project can be fun and exciting, even if done at a small scale and at your own speed. Once begun, you will never see your own stream, or any other, in quite the same way again. Wetlands have always been important to me from childhood through my teen years, early adulthood, mid-life, retirement, now. Protecting what’s left first took all my energy, but now learning, perfecting, applying new restoration measures to needy areas has priority. Saving what’s left is important, but is not enough by itself. It is too late for that. I have restored wetlands in New Mexico, Arizona, Texas and Colorado, never alone, of course, but always with the aid of other dedicated people – landowners, friends, volunteers, non-profits, financial backers and dedicated agency personnel, local, state, tribal and federal. Thank you! Lots of agencies take part in one way or another, but there is no “Wetlands Conservation Service” out there promoting wetlands restoration. That leadership will have to come from individuals like you and me and the organizations we trust and believe in. I once read somewhere that New Mexico has less surface water area per capita than any other state in the Union. Much of that is stored artificially behind huge concrete dams, some built prior to statehood. This happened at the expense of extensive wetland and riparian areas, as well as towns, croplands and even cemeteries. 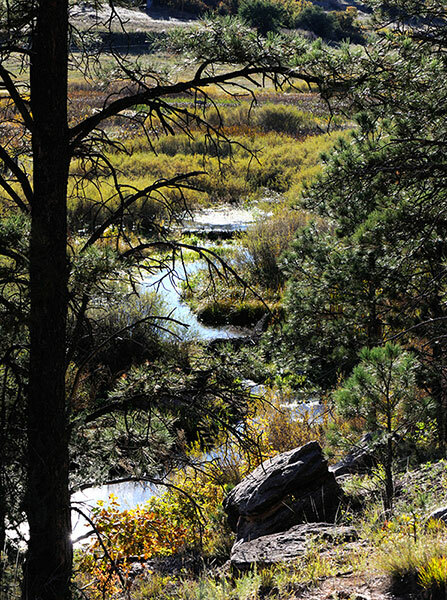 According to the National Wetlands Inventory, New Mexico has lost about half of its natural wetland resources. That’s about the same as Arizona. Half is bad enough, but it is, luckily, far, far less than California, which has lost 92 per cent of its wetlands. What portion of New Mexico’s remaining wetlands are salvageable, and how could we do that? Why bother anyway? What good are wetlands? Can I use my bare hands to restore an ailing wetland, or is heavy equipment essential? Might anybody want to help me? Why would they want to do that?